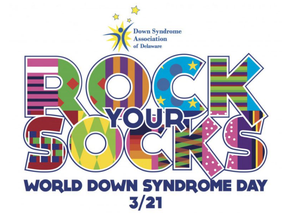 On Thursday, March 21, 2019, the Seaford School District will be joining other schools and organizations around the world in celebrating WORLD DOWN SYNDROME DAY with ‘Rock Your Socks’ day. 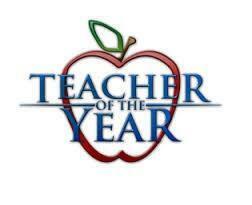 The 2018-19 Delaware State Teacher of the Year, West Seaford Elementary School’s Dana Bowe, has used part of her State Teacher of the Year monetary award to purchase socks for ALL students and staff in the Seaford School District as a way to promote acceptance of students with Down syndrome. We look forward to everyone 'Rocking their Socks' on Thursday. connections, and community, that focus on the value and benefit of family reading routines, regardless of language. Bilingual texts are shared each week with families through a lending library system. Trained educators work with adult family members, creating a shared family experience during which both parents and school age children learn English vocabulary together. While many go through the rigorous application process, only a handful of winners are selected each year. Programs range from single classroom programs to collaborations between classes and other schools, or through community partnerships. 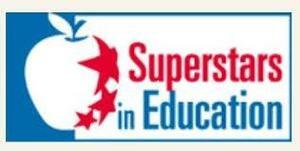 This years Superstars winners will be recognized at a reception and awards ceremony on Monday, May 13, 2019. 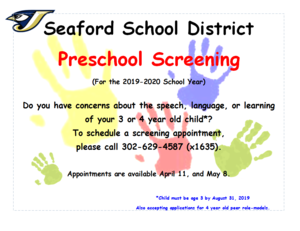 Do you have concerns about the speech, language, or learning of your 3 or 4 year-old child and they live in the Seaford School District? Please call 629-4587, ext. 1635 for a Screening Appointment. Appointments will be held on Thursday, April 11 and Wednesday, May 8. **Children must be age 3 by August 31, 2019. Members of the Seaford High School chapter of the Business Professionals of America (BPA) attended the 2019 State Leadership Conference for Business Professionals of America in Dover. Team members competed in a variety of events from Digital Media and Economics to Presentation Management and Computer Events. Our students found much success and brought home 13 awards, the most ever for a Seaford High School Chapter. Seaford also won the Professional Cup signifying the top State chapter in Community Service. Additionally, Noelle Kuhoric was recognized as the Student of the Year. 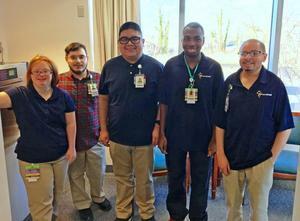 Project SEARCH is hosting an event to share about they ways that the program works with Nanticoke Hospital to promote inclusion in the workplace. Plan to attend to learn more about this great partnership.